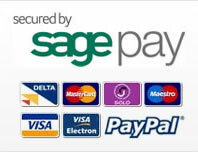 We accept MasterCard, Maestro, Visa, Visa Debit, Visa Electron, JCB, Solo and Switch through SagePay. We also accept PayPal. We will not be held responsible for pricing errors due to software malfunctions, or human error. This website operates on an 'invitation to treat' basis and not as an 'offer for sale' as a result. If you are unsure of your purchase please contact us before placing any order. Products and prices are subject to change without any prior notice. When you checkout your order you will be passed on to a Secure Order Processing page hosted by Protx, your details will be encrypted by 128-bit industry-standard Secure Sockets Layer (SSL) technology to provide encryption of personal information such as your name, address and credit card details. Your credit card details will not be stored on our systems after payment. Please read the returns policy in its entirety before contacting us to return any of your purchases. This will allow us to deal with your return quickly and efficiently. Refunds for items returned will be credited to your credit/debit card within 30 days of cancellation. Please note that delivery charges cannot be refunded. Should you require to return any product, you may do so at any time up to 7 working days starting the day after you receive your delivery. Please ensure you contact us first to receive an authorisation number. TLC Pharmacy will not cover return postage costs. Items should be returned to us by Recorded Delivery or courier service. We advise that you obtain a proof of posting certificate available free at any post office. If you receive incorrectly supplied goods from us we will offer you a prompt replacement, refund or alternative item to the same value. Please contact us with 7 days quoting your original order number and we will arrange for the uplift and delivery of goods. If you receive damaged or defective goods from us please contact us within 7 days quoting your original order number, and we will arrange for the uplift and inspection of goods. Should we, upon receipt of said items be satisfied as to the alleged defects we will either replace the goods or arrange a refund of the full value of the goods. We advise you return goods using special/recorded delivery or equivalent service. You can obtain a proof of posting certificate free at any post office. TLC Pharmacy will not be held responsible for any uninsured items lost in transit.